I am seriously considering unfollowing everyone I know from high school, cheese stan accounts, and Lena Dunham on Instagram and replacing them all with celebrity animals. Time has helpfully created a list of all the best furry friends to follow so you don’t waste your time with unphotogenic garbage animals. Some, like Doug the Pug and Grumpy Cat, have been superstars for a while now, but others, such as Jill the vegetarian squirrel, are brand new to me. 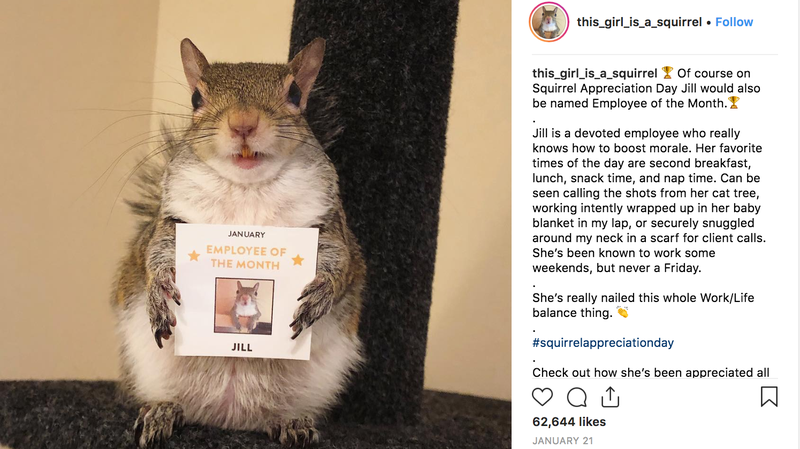 Maybe your week was good, but was it “famous squirrel also winning employee of the month” good?